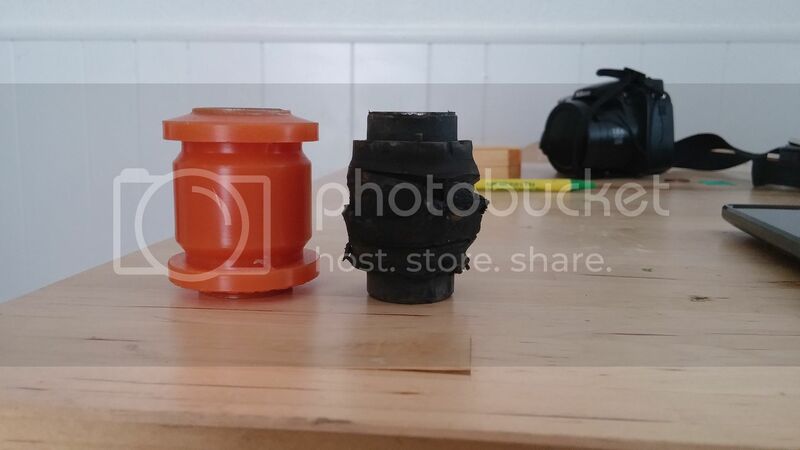 MS6 front and rear polyurethane suspension bushings | Mazdaspeeds.org, The New Era in Mazdaspeed, CX-7 & Ecoboost Forums! Discussion in 'Mazdaspeed 6 Suspension & Brakes' started by phate, Feb 17, 2016. 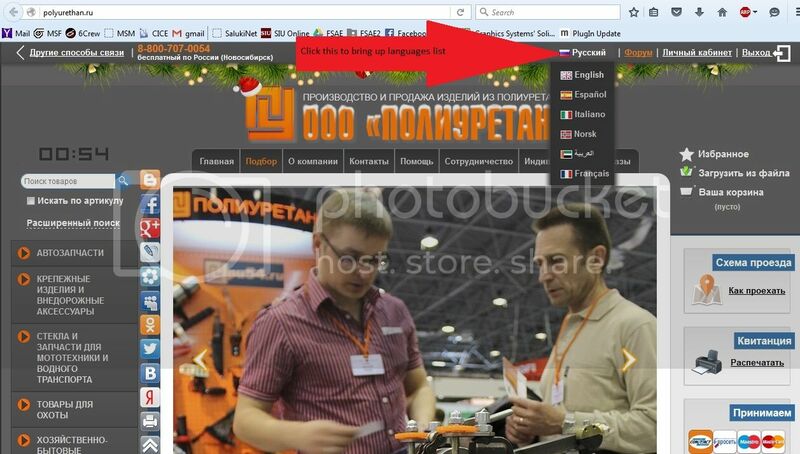 Everything is from http://www.polyurethan.ru/ Yep, straight from Russia. I sent a few emails back and forth and they confirmed these work so I picked them up. They also confirmed some front suspension bushings they make will work, as well. 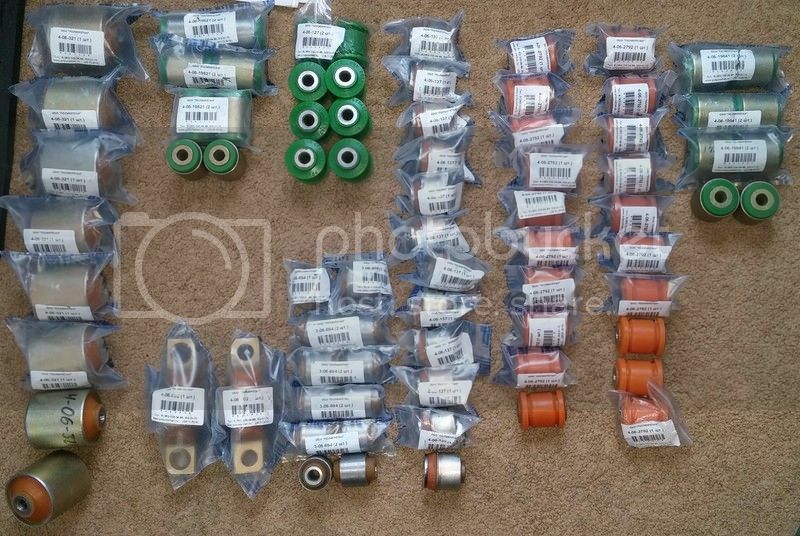 My whiteline front suspension bushings barely lasted 6 months, so I'm going to use the Russian bushings as replacements. I've placed two orders now with this company and they've been great. Bushings are nice quality and the ones I installed last year haven't had an issue. Notice the * next to 4-06-2792. That is a note that these can be used in the toe links IF you reduce the ID to that of the LCA. You need to have a sleeve machined to do this. It works great. The 4-06-127 has now been confirmed to work, so this is unnecessary. 4-06-137 and 1371 are two different versions for the front UCA. You need one or the other. Orange is softer, green is harder. The green ones were not in stock when I ordered, but if they were available that is what I would go with. 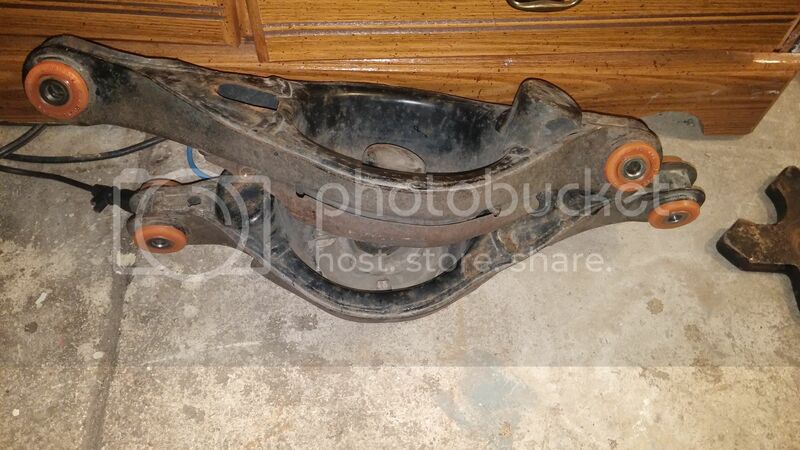 4-06-602 - Trailing arm bushings. One of these bushings did not fit as tightly as I would like. It's probably ok to use, but I'm going to epoxy it in place just in case. I'll update in the long term. I'll update as I get them installed. You might be wondering about the ordering process and how safe it is. They accept PayPal and Western Union. PayPal offers serious buyer protection, so that sealed the deal for me. Shipping options that show up on the site vary a bit, and it might vary depending on shipping location (no idea). Russian EMS, DHL, and another Russian postal service have shown up at times for me. I have used Russian EMS, and I highly recommend it - to the point where if it doesn't show up you should email them to ask for it. I went with Russian EMS (also called EMS Express). They hand off to USPS state side and tracking works along the entire route. It took 10 days from the time I ordered to the time it was delivered. My second order took around 3 weeks to come in. Shipping has cost $50-80 using this method. They were pretty helpful through emails, so hit them up if you have any questions for them. The actual ordering process is not typical for an online store. You submit your order and put in all of your shipping info, select the shipping option, then wait for them to invoice you through PayPal after shipping is calculated. It was all pretty quick, just remember they're on the other side of the world so if you email during the day, you might get responses at odd hours. They were always pretty quick to reply, though. Great write up man! much appreciated! Any noticeable difference in ride quality or harshness? I'll need to go over my suspension in the next year or so, almost 150k and I'm pretty sure it's all original. These seem really appealing and the price is great. I'm looking forward to getting these installed! Thanks for doing this. Nope. The orange poly is similar to OE rubber hardness. I've not had any issues. I'm going to have the rear suspension apart tomorrow, so I'll take a closer look and get some pictures while I'm doing some stuff. 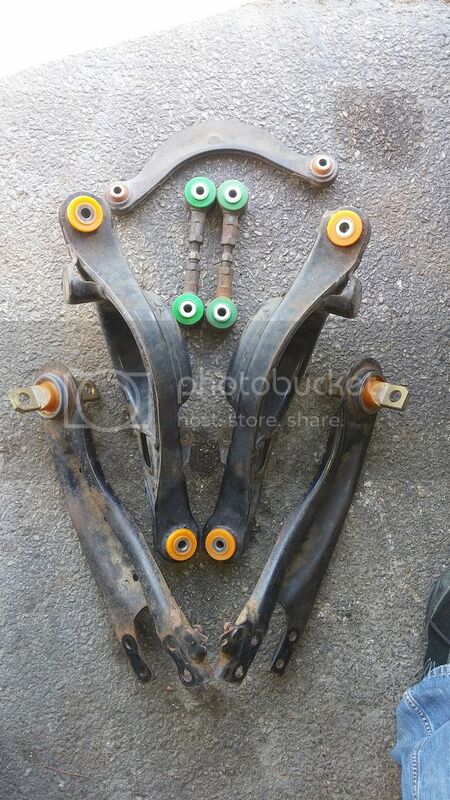 Also planning to put in the trailing arm, toe link (4-06-127), and LCA bushings while I'm back there. The 4-06-127 bushings measure out fine. They don't have quite as much of an interference fit as the LCA bushings do, but that may be by design of the harder green material. I did the rest of the rear suspension bushings today. 4-06-127 works perfectly in the toe link. 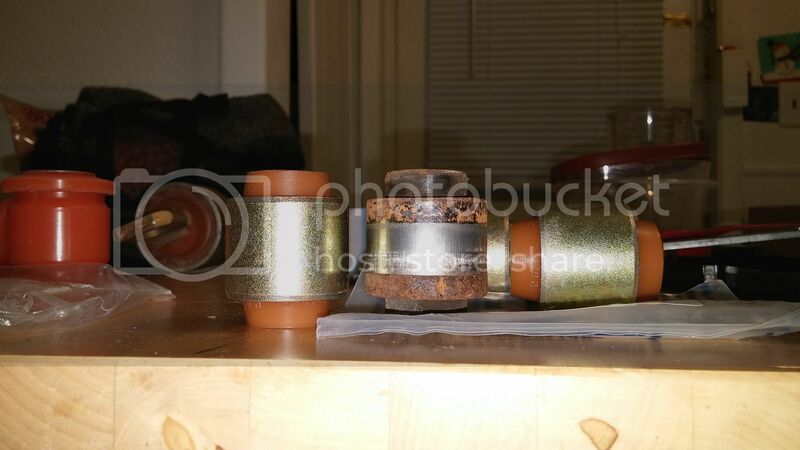 I installed the trailing arm bushings with a light coating of JBWeld. One of my flanges was a little loose and didn't hold the bushing quite as tightly as I would have liked. I worked the flange a little bit in the press and it got to the point where it probably would have been ok without the epoxy, but I used it as a precaution. I'll report on this long term. I had the UCA bushings in place last year and they've held up fine. 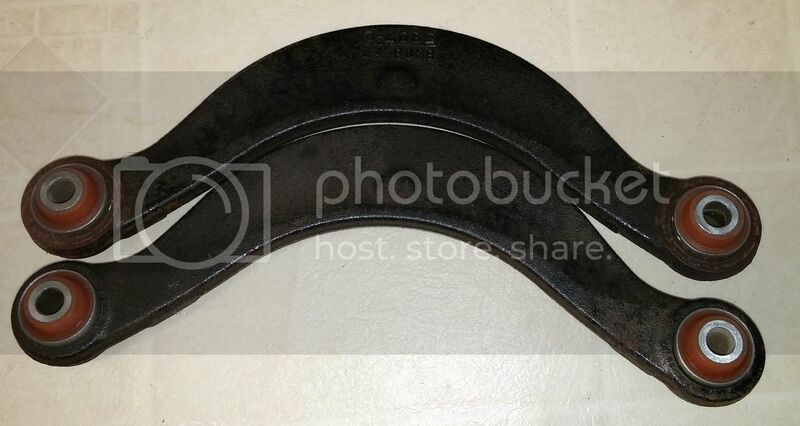 I had the 4-06-2792 bushings in the toe links with a sleeve to reduce the ID (4-06-127 wasn't available at the time) and they held up great, also. I replaced the toe link bushings with the ones seen here. Thanks for the info. I'm sure mine aren't to far from going out since the car is 10 years old now. 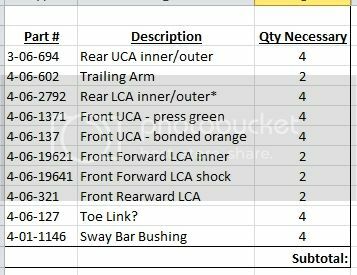 Just wondering if this list is for all bushings front and rear? Also 306694 also comes up as 306694m, which one do i need? 3-06-694 is the one you need (without the m). What list are you referring to? Just placed my order with russian post. Will let you know how long it took with that option when they email me back. About 2 months for $20. Will pay more next time for faster shipping. CorkSport Front Brake Pads Are Back For the Speeds!